Sometimes I’ll think back on the heady days before I studied nutrition. In those saccharine days, before I could connect action with consequence, I’d pop macarons like tic-tacs, and then wonder why I felt tired and moody afterwards. Now I am both a realist and a nutriphile. I’ll still always have a Laduree rose macaron every time I’m lucky enough to be in Paris. For those other times, I’m excited to have created this little pudding. Creamy, exotic and a little bit special. 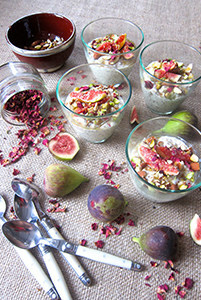 Oh, and it’s full of the of those chia seed super- thingamies… you may have heard of them. As well as being an ingredient here, pure rosewater also holds the title of My All-time Favourite Beauty Product. I buy it in bulk from an essential oils distributor and use it as an alcohol-free toner, facial spritzer and make-up setter. I find it pretty darn amazing for my rosacea-prone, sensitive skin. Plus it smells pretty. Which is always a good thing. You’ll need a proper free-standing blender for this one, the more powerful, the better. Hand blenders don’t quite cut the mustard. 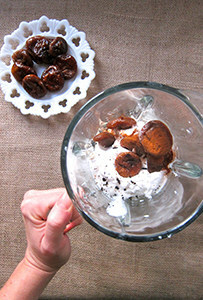 In your blender, combine the soaked cashews with everything in the pudding list above. Blitz. Like crazy. For 2 minutes. Then taste. You can always add more honey if you prefer. Put your chia seeds in the bottom of a large, dry bowl. Pour the blender mixture into the seeds, whisking as you go to avoid the chia seeds sticking together. For the next 10 minutes, give the bowl another friendly whisk every few minutes, before covering and placing in the refrigerator for at least an hour. 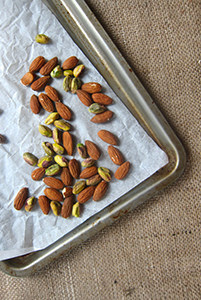 Meanwhile, toast the almonds and pistachios on a baking tray at 160 C for about 11 minutes. Remove from the oven, allow to cool and chop roughly. 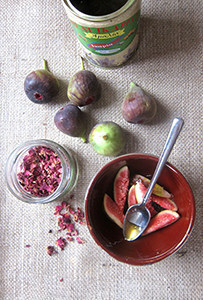 If using, slice your figs into small crescents. Remove the pudding from the fridge and whisk one last time, before spooning about a tablespoon and a half of the mixture into 6 small receptacles. Re-refrigerate and decorate later. 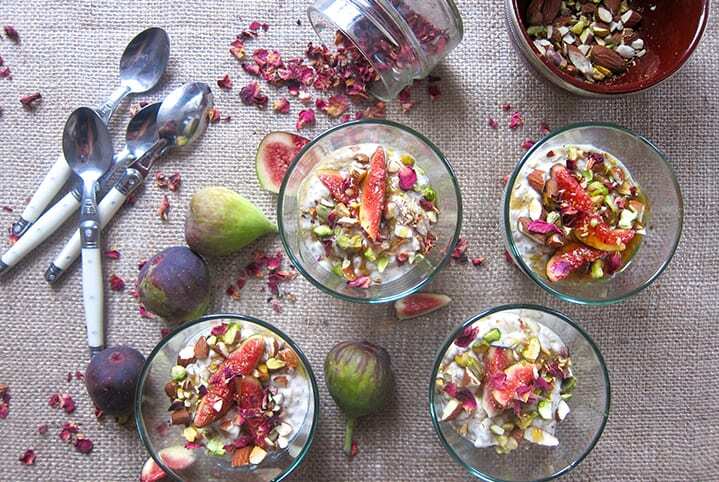 Or sprinkle with the nuts and fresh figs/ rose petals to consume immediately. 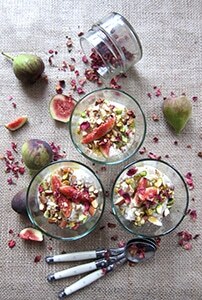 *A note on toppings: I’ve found tangy fruit toppings overwhelm this delicate little pudding, so I’d recommend sticking to just nuts and figs for this one.